Traveling to Turkey… Visa Required. Are you wanting to travel to Turkey? Do you know the regulations to enter the country? Being a European can simplify your travel plans, but entering Turkey from non-European countries can be more complicated. A traveler from India, for instance, with a valid passport is also required to purchase a visa before entering the country. Further inquiry as to the details of how to obtain this visa reveals a dizzying array of advice on the best way to acquire the visa. 15 Euro / 20 USD seems to be the current going rate though other Half of the reports say that you must buy the visa in advance, half say that you get it at upon arrival and all have the first-hand experience to back it up. Accounts of the process makes one wonder if Turkish customs is not somehow a satellite office of the DMV. While Turkey’s official Ministry of Foreign Affairs website makes the process seem fairly straightforward it is notoriously outdated (even when it has “just been updated”) and the regulations are in a near constant state of flux, and are subject to change without warning. In reality it can depend on the particular official you get that day. 1. Bring cash! Visa fees are payable in most currencies – GBPs, Euros, and USD$. In true bureaucratic form, they do not accept their own national currency, Turkish Lira. 2. No dirty money – Turkish border officials are notoriously particular about the condition of the money: do not try to pay with torn, dirty, or defaced bills. 3. Most of the Turkish visas are single entry and once you exit the country re-entry is not allowed so plan accordingly. 4. Often tourist visas aren’t checked so whether you buy the visa upon arrival or in advance, if you are not asked to present the visa DO NOT SHOW IT!! This eliminates the process of being held up by any visa-related discrepancies or errors that may be present. Traveling to Turkey can be very difficult, but some countries do no have it as hard as our above example India. For instance, countries like Germany, Greece, France, New Zealand, Japan and Singapore, and as well as many other countries, have the right to stay in Turkey for 90 days without obtaining a visa. Other rules apply to individuals who want to stay longer than a day, or longer than 90 days. Staying for longer than 90 days requires a visa from a Turkish Embassy or Consulate before arrival. And if one is planning on working or studying there, one “must also apply for a residence/work permit or Turkish ID card within the first month” of arrival. Important! – Be sure to check the stamps on your passport, because you do not want to overstay. Overstaying can cause serious problems, like a fine or being deported. For more information, contact a US Embassy and check with specifics including the laws that may be foreign to you. Germany is experiencing the end of an era with the recent August 22nd death of Bernhard Victor Christoph Carl von Bülow, pseudonym “Loriot.” For decades, Loriot has characterized and personified German humor, as well as confused and confounded American and British comedians. It would be a decently safe assumption to say that Loriot lead and directed German humor. His influence is massive and lives on even after his death. Dieter Wedel, one of Germany’s most famous television directors (known for shows like Tatort and Schwarz Rot Gold) once said, “The Germans don’t have any sense of humor — the Germans have Loriot!” However, such a broad, sweeping statement also asks the question, what is German humor and why is it so widely misunderstood? Many German jokes are based on double meanings, coming from German’s favoritism towards taking many words, ideas and concepts and crashing them into one (sometimes absurdly) long compound word. The German language has very strict grammatical structure and often relies more on humorous ideas opposed to English’s reliance on wordplay. Loriot brought a sort of inanity to his work with the juxtaposition of his character’s dignified behavior against the exaggeration of their features. This is typified in his short sketch Herren im Bad. Seriousness combined a focus on banal flaws is a stereotypical theme in German humor. This is also seen in the way that Germans observe and perceive the world and people around them. I mean, there is no serious data to prove this and I’m being entirely subjective, but in my experience, Germans do not focus on personality flaws as something you can easily change, but instead as something that is a basic part of a person’s being. You aren’t dumb because you don’t study, you’re just dumb because you are. They’re not going to shun you for being a bit socially inept, they’re just going to accept that you’re kinda weird and run with it. Needless to say, Americans generally DO NOT get this. The problem with German humor, is that you need to understand German to get it. You can’t explain or clarify the nuances of German diction or the play of grammar in English. Comedy doesn’t translate. Loriot’s genius comes from the fact that he was exactly as meticulous with his words as he was with his physical comedy. He made fun of the narrow-mindedness of and excessive formality of German while maintaining respect for the language’s tone and essence. It might be thought of as the best way to be killed by a serial killer in the USA, but in Europe hitchhiking is still trucking along. In my father’s youth growing up in England, hitchhiking was a common way of transportation to explore Europe and the world if you were a student or wanderer on a low budget… or if your motorcycle broke down in Germany and you need to get home. Now there are more concerns about safety and the legality of thumbing a ride for your summer adventure – with many people preferring to travel via a rail pass. Yet this has not stopped the hitchhiker culture from continuing to roam. While my father kept a written journal in the 1960’s, people are now blogging about their hitchhiking adventures. 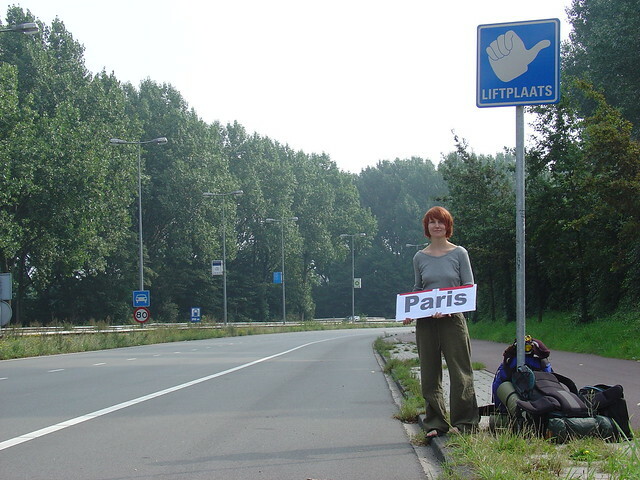 Inga of Latvia is currently chronicling her days hitchhiking from Cologne, Germany with friends she made on facebook. Even putting together a list of unwritten rules for hitchhiking successfully. She is now in Bratislava and will soon be on the move again. Most posts I’ve found have centered on the safety of hitchhiking – the key part being to hitchhike only where it is legal (most of Europe, but not on highways or autobahns) and to be aware of who you are taking a ride from. Of course with the wonders of the internet there are a ton of interesting guides for backpackers, including Wiki guides and more “organized” hitchhiking though ride sharing sites like www.mitfahrgelegenheit.de, where a small fee is paid to the driver for petrol – but many still prefer the uncertainty of thumbing a ride old school, finding their way to the edge of town to catch a ride. As much as I enjoy being organized, if I am going to backpack and wander across Europe, I’ll do it like my father did, experiencing the adventures good and bad that come with rides from strangers so I can have some interesting stories to tell later. Imagine traveling the world on a motorbike, Ewan McGregor-style. For ten years, you make your way through more than 69 countries and over 300,000 kilometers, meet hundreds of interesting people and take photos throughout your journey. You visit every state in the U.S., catch a ferry from Venezuela to the Dominican Republican, get thrown in jail for three months in Cuba and have innumerable adventures. Now imagine that you are doing this without the ability to hear or speak. That is the story of one amazing man, 69-year old Belarusian Vladimir A. Yarets. Maybe you’ve heard of him? As a friend pointed out, the trip is strangely similar to Ewan McGregor’s three-month motorbike tour in 2004, documented in the Bravo channel’s The Long Way Around series. Just for the record, though, Yarets had the idea first (he started his tour in 2000). Sorry, Ewie. But as amazing as his journey is, it seems that not every place he visits is entirely welcoming. London writer Peter Marshall laments the city police’s response to Yaret’s arrival in Parliament Square in April. Despite the evidence of Big Ben behind him, Yarets wasn’t in London, but had landed on Planet Security, a make-believe world where a remarkable man travelling the world on a BMW despite his disability is seen not as someone to be welcomed and applauded (and I’m pleased to have shaken his hand) but simply as a security risk. Still, according to an article from The Week, Yarets says through an interpreter that although many people are indifferent to his journey, there are always those who are friendly and happy to help. One of these helpful people Yarets met in Singapore started blogging about it. Interesting tidbit: the blogger says Yarets never asked for money, but when the blogger noticed that Yarets’ glasses were broken, he and his friends chipped in to buy him new frames. When they noticed his fog lights weren’t working, they found him a sponsor to pay for new lights. He even took this photo that explains why Yarets is making this long, dangerous, undoubtedly tiring journey. Now doesn’t that just make you all warm and fuzzy? Anywho… whether it’s diets, diet books, diet pills, protein shakes, exercise regiments, personal trainers or the like, Americans seem to have an obsession with fitness in a way that is foreign to the French. So, what seems to be different about the French fitness attitude? In a Salon.com article, Claude Fischler, a nutritional sociologist at INSERM (the French equivalent of America’s National Institutes of Health) says some of the paradox is myth. Nonetheless, he says the French eat “Comme il faut” – “As it should be.” He adds that unlike American women, French women eat exactly what they want and don’t spend hours at the gym trying to get in or stay in shape. Hmm…sounds a bit like the “practically pain-free” weight loss radio advertisement I heard in my car earlier. Now You Can Cop the Parisian Attitude! What words just came to your mind? Before you read further, take minute to let the various nouns and adjectives flow freely. If you’re an American, there’s a good chance some of the negative words that just popped in and out of your mind were ones like arrogant, lazy, coward, dirty, anti-American, socialist (maybe even communist? ), hairy and rude. Now, I’m sure words like food, wine, fashion, Eiffel Tower, romance, cheese, art, tradition and maybe even fries came up as well. But, for now we’re going to take a look at the role these negative descriptors play into France’s – specifically Paris’ – tourism industry. Big surprise to me and maybe to you as well: Turns out, there are actually tourist manuals that help educate the Paris-hesitant traveler on how to “cop” the Parisian attitude. Yes. It’s true…you too can now be as rude as some deem the French to be! The campaign is directed toward Brits who’ve turned to other tourist destinations where they can more pleasantly spend their spare pounds. While offensive to some, some heavy-hitters in the tourism industry have welcomed the humorously helpful travel tips through the “if you can’t beat them, join them” approach. Personally, I never felt the need to use any of these gestures, nor did I find it necessary to “cop” the Gallic, French attitude while visiting the City of Light. However, for the nervous or hesitant tourist who is debating whether or not to visit Paris, humorous tips like these may help you make light of any rudeness you may encounter. To take a peak into more aspects of French culture, please visit TheSecretLifeofFrance.com for an Englishwoman-now-living-in-Paris perspective. 2 Comments	Now You Can Cop the Parisian Attitude! If you want to have a 5-minute, artistic, cross-cultural audiovisual experience then look no further! The European Music Office, a.k.a. EMO, produced a urban hip hop project in 2008 called Diversidad, which was created to promote dialogue and exchange through European urban culture…and MAN is this video clip musically and lyrically powerful – in several languages! The project was selected for 2008’s “European Year of Intercultural Dialogue” and performances were held across the continent. Hip hop artists from Germany, France, Norway and Spain were just some of those involved in the production and performance of Diversidad, making it the first time the best artists of European hip hop were brought together, according to EMO. Do you think we over here in America should do something like this? Is there a parallel to Diversidad in this country? Take a gander at the video. You’ll understand what they’re saying even if you don’t understand all of the words.